In the past, whenever I reached for the smoker, it was always for a slab of meat: brisket, pork shoulder, ribs. I’m surprised it took me this long to finally smoke some fish. What have I been waiting for? 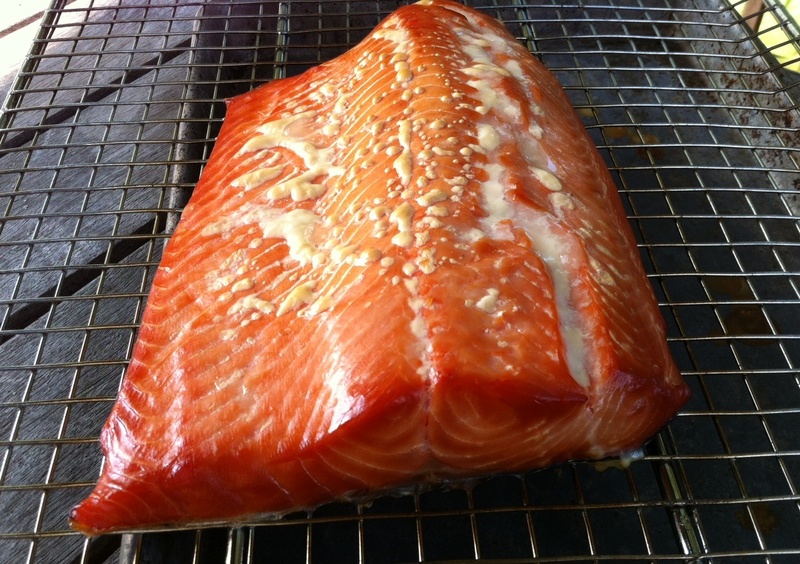 Brining and smoking fish, in this case a hunk of wild-caught Alaskan salmon, is really not difficult to do at all: you brine the fish in a simple salt, pepper and sugar solution for a few hours, let the hunk of fish dry, then throw it in a smoker for a couple of hours. It’s really that easy. This method is called hot smoking, not the cold smoking you often see described on packages of store-bought salmon. Cold smoking is a process that takes days and requires equipment that most homeowners don’t have, and don’t need. About the fish: I’m not a fan of traditionally cooked or poached salmon. I like it raw or I like it smoked. I never buy Atlantic salmon or any other farm-raised salmon because of the way they raise them: in large pens out in the ocean, fed food pellets and antibiotics, over-crowded and diseased, polluting the waters around them with waste. Wild-caught fish are just that: they eat their natural food sources. They are not crowded so they don’t need antibiotics. And you can tell the difference when you look at the beautiful bright orange flesh. Does the good stuff cost more? Of course. Worth every bit. Though I try to make sure all the small bones have been removed from my fish, I like to keep the skin on the filet, because it helps hold it together in the smoker. I always keep the fish cold in the fridge until it is ready to be brined. Combine the ingredients in a large pitcher made of glass or plastic and refrigerate until very cold. Once the fish has been brined, remove it from the container and rinse it well under fresh water. Pat it dry with paper towels and place it where it will get air circulating all around it. I use a small rack that stands an inch over a sheet pan. If you leave the fish out at room temp, do it for no more than an hour. Otherwise, it can stay in the fridge for up to 3 hours. As the fish dries, it will form a shiny coat on the surface called a pellicle. This will actually help the smoke molecules adhere to the fish. Start up your smoker. I use a digital smoker that runs on electricity, so I pre-heat to 220 degrees. When the fish has dried, I place it in the middle of the smoker and then add hickory chips to the smoker. I smoke the fish for about 2 hours, until the internal temperature of the fish is about 140. Once it is smoked, I let the fish cool to room temp before I wrap it tightly and place it in the fridge for storage. Eat it within a few days…that should not be a problem! Thanks! It is quite tasty and easy to do.